"This book was born ages ago when a recruiter noted I was good at telling my career story. Eventually I realized that storytelling is core to a good resume (and a good job search). I wrote down my lessons and blogged about them, and later realized I should just roll them up in a book. Besides, whenever my friends ask me about how to do a resume now I can just send them a copy . . ."
Now in it's second edition! "Epic Resume Go!" treats resume writing as a storytelling exercise. Like any great novel or blockbuster a resume has taglines, a main character (you), backstories, and more. With helpful exercises and a sense of humor, this book will help you make the resume writing experience exciting - or at least tolerable. It's time to make your resume epic! New ways to view each part of your resume and how it sells and tells your story. Exercises and advice to help you find your story, your Opening Statement, Skills List, Job History, and more! Short and sweet. At just 46 pages, you can get reading and then get moving fast! Epic Resume Guide! 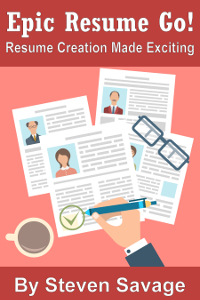 - A one-page guide to the Epic Resume components - and a useful guide to resume layouts! - A presentation I've given on the Epic Resume theories!